PET stands for polyethylene terephthalate. Part of the polyester family, it is used to make synthetic fibers as well as food and beverage containers. Products made with PET are lightweight and are proficient at blocking gases, solvents, and moisture. They are also strong and impact-resistant. 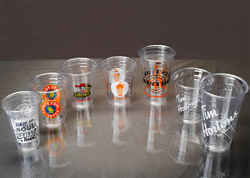 Products made from PET can also be recycled.Available with us is an exclusive range of Pet glasses these glasses are superior in terms transparency andQuality.We cancustomizethe glasses as per the requirement of the customer.These glasses are available in various sizes from 70ML to 350ML along with the Flat and dome lid. 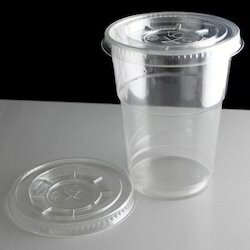 These plastic glasses are used for Drinking Water, Wine, Beer, Whisky, Milk Shakes And Cold Coffee. With thorough industry knowledge, we are engaged in supplying and distributing a wide range of HIPS Disposable Plastic Glasses. The offered products is developed using an state-of-the-art manufacturing facility under the close supervision of experienced and qualified professionals assuring Quality,leaf proof and by using food grade raw materials. These glasses are used for serving Tea & Coffee (Beverages) in corporate offices, restaurants, hotels etc. Furthermore, clients can avail these in various sizes from 65 ml to 200ml and can also customize the same. Available with us is an exclusive range of Pet glasses these glasses are superior in terms transparency andQuality.We cancustomizethe glasses as per the requirement of the customer.These glasses are available in various sizes from 100ML to 500ML along with the Flat and dome lid. 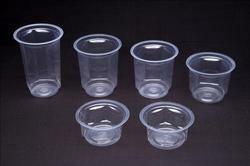 These plastic glasses are used for Drinking Water, Wine, Beer, Whisky, Milk Shakes And Cold Coffee. We are one of the accredited suppliers and distributors of a premium range of Disposable PP Glasses. These products are manufactured employing high grade material and latest machines & equipment. Available in various designs, shapes and sizes these products are used for serving Beverages (cold drinks). Our reasonably priced product-line is widely acknowledged in market for its reliability, fine finishing and admirable quality. Looking for “Plastic Glass PP , PET & HIPS”?